Making it to the Scripps National Spelling Bee is an amazing achievement for any kid. But for 11-year-old Neil Maes, being born deaf made his journey especially unlikely. After receiving cochlear implants in both ears as a baby, he had to train his brain to understand spoken words. It took countless hours of speech therapy. "We didn't even know that he'd be able to talk. It wasn't a guarantee," his mother, Christy Maes, said. Now the soft-spoken kid from Belton, South Carolina is officially one of the nation's top young spellers. 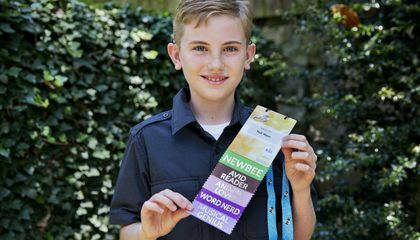 He earned the right to take the stage with 281 others in preliminary rounds of the Scripps National Spelling Bee in Washington. The final rounds are May 26. The only assistance Neil requires is that the bee's pronouncer will speak into a microphone. It transmits an FM signal directly into his cochlear implants. Similar to the technology he uses in school, it allows him to filter out background noise and focus on each word. Neil's parents have given him another tip. They coached him to always ask the pronouncer for the definition of a word, so that he can be sure he heard it correctly. Most contestants do this anyway. Peter and Christy Maes had no experience with deafness in their families. It turns out they're both carriers for a genetic mutation. It causes hearing loss. Neil got his first implant at 11 months old. One of his two younger sisters was also born deaf, and has implants as well. "My goal was for him to meet his potential, no matter what it was," his mother said. "It turned out to be pretty good!" Cochlear implants bypass the non-functioning parts of the ear. They send an electrical signal directly to the hearing nerve. While speech, music and other noises don't sound exactly like they do to a person with normal hearing, the brain can learn to process those sounds in a similar way over time. This is according to Dr. Michael Hoa, a surgeon at MedStar Georgetown University Hospital who performs cochlear implantations. But these implants are merely a tool, the doctor said. Neil's intelligence and work ethic get credit for the rest. "He's able to handle very complex words. You tell him, 'Spell this word,' and he's able to actually visualize what that sounds like in his head and spell the word. It's actually quite impressive," Hoa said. "There's a lot that goes into training your brain to do that." Christy Maes gave up her nursing job to help Neil through speech therapy. Now she works as a preschool teacher. She choked up several times when talking about her son's journey in an interview at the Alexander Graham Bell Association for the Deaf and Hard of Hearing. It's a group that advocates for early intervention to help hearing-impaired kids. Neil's parents didn't know he was participating in a spelling bee with his third-grade class until he came home and told them he had won. He made it all the way to his regional bee that year. He finished second. Now a fifth-grader, Neil is naturally shy and already worn out from the hectic bee-week schedule. He seemed happy to let his mom do most of the talking. "Our main hope out of all of this was to encourage and inspire people that are going to be facing what we had to face," Christy said. But Neil said coming to the bee has motivated him to study even harder, so he can return next year. "It's just fun," Neil said, "because I've never been here before, and I just want to do it again." Neil must train his brain to understand what people are trying to say to him. Neil must "train his brain" he was born deaf so his brain works differently than people who can hear. Neil's brain picks up sounds differently than people who can hear. Because Neil got his cochlear implant he can now hear things he could not before. This sudden change in what is audible is something Neil must adapt to. Neil must "train his brain" to pick up sounds the same way most people do but this is difficult for him because it goes against what he has been doing his whole life. He has to rewire his brain so that he can hear noises and not rely on his other senses like he has been before. In conclusion Neil must train his brain because he is changing what he has been relying on his whole life so he has to adapt to that. Neil must train his brain so that he can read and hear what is coming out of people's mouth. I found this article interesting because I did not know that someone can overcome being deaf. Neil must "train his brain" because during the spelling bee, he's going to have to understand what the people are going to be saying to him, (because he is deaf). His parents told him to ask for the definition of the word as a tip for him, (paragraph 7) I thought this article was interesting because It's cool that a deaf person is competing in a spelling bee. Neil worked very hard to get to where he is now. He was deaf, and had to learn to hear and recognize words. This is in a way like normal kids. They learn to recognize words that are said to them. But, Neil was deaf and it was hard to this. It is also incredible that he got to nationals in the spelling bee. He really did work hard to achieve that goal. Critical Thinking Question Answer: Neil has to train his brain, because he was born deaf and need to learn how to recognize and hear words. Neil must train his brain because of his cochlear implant, his implant bypass the non-functioning part of the ear and send electrical signals straight to the hearing nerve and these signals don't sound the same to him but over time he can train his brain to sound the same way as everyone one else hears them, "noises don't sound exactly like they do to a person with normal hearing, the brain can learn to process those sounds in a similar way over time. "(paragraph 10) This article was interesting because its amazing to see how with a bit of hard work anyone can accomplish their dreams. Neil must "train his brain" because he used to be deaf and couldn't talk. He had to learn how to speak. He also had to learn how to hear with his new hearing aids. After learning "how to hear" Neil entered the Scripps national spelling bee. He got into the finals which are held today, May 26th. Neil must be really amazing. He was able to use his brain to win a spelling bee and he was also very smart. I don't think that I would be able to do that if I was deaf. But also Neil must have done a lot of practice to win the spelling bee. His mother must have thought that Neil was very special and also that he did well. I also think that Neil did a good job. Neil must "train his brain" because since he is deaf so he has to sound words out. I really like this article because it is incredible how he never gave up and how he was in a spelling bee and came in second place. I was surprised because it said "Cochlear implants bypass the non-functioning parts of the ear. They send an electrical signal directly to the hearing nerve. While speech, music and other noises don't sound exactly like they do to a person with normal hearing, the brain can learn to process those sounds in a similar way over time." and it amazing. Neil must train his brain so that he can understand words using his cochlear implants. Neil Maes, being born deaf, "he had to train his brain to understand spoken words." (paragraph 2). Since Neil's parents both are carriers for a genetic mutation, which causes hearing-loss, Neil and his sisters were born unable to hear. But, with technology, the siblings use cochlear implants in their ears to hear spoken words. Even with this, Neil has to train his brain to recognize words and phrases. That is why Neil must "train his brain". I thought this article was interesting and found that Neil is a national spelling bee competitor surprising.